COUPLES reveal the worst bare-faced lies they’ve told their lover. We’ve all told little white lies at times, but some people have been brave enough to share the sordid tall stories they’ve gotten away with. 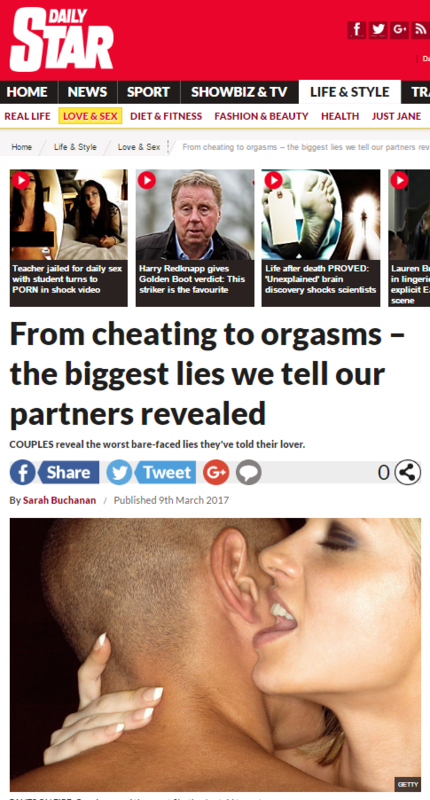 According to a new survey, a whopping 75% of Brits admitted lying to their partners and one in 10 reckon they do it regularly – with men expected to tell the most porkies. The poll of 2,000 adults by TV show Imposters also found that a quarter of the population don’t completely trust their current partner and 5% don’t trust them at all. If you’re unfamilar with Imposters as a TV show, it’s a show about con artists. Which puts the ‘people lie!’ angle of this press release into somewhat helpful context. This entry was posted in Imposters and tagged daily star, Honey Langcaster-James, Imposers, Sarah Buchanan on March 23, 2017 by Michael Marshall. The nation’s families are having a combined eight million arguments a day over digital gadgets, a survey shows. The biggest source of strife is parents feeling children are too absorbed by computers or tablets to communicate properly. 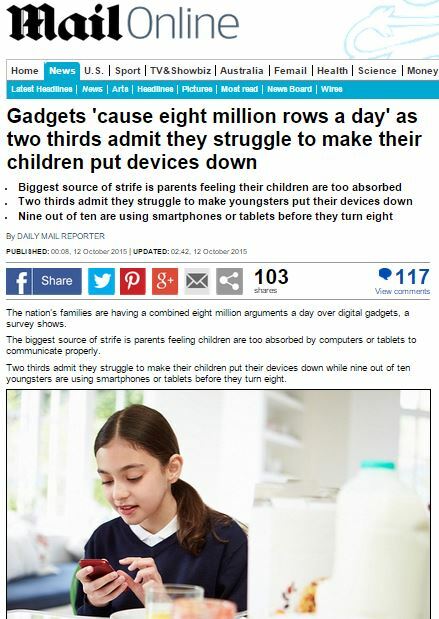 Two thirds admit they struggle to make their children put their devices down while nine out of ten youngsters are using smartphones or tablets before they turn eight. 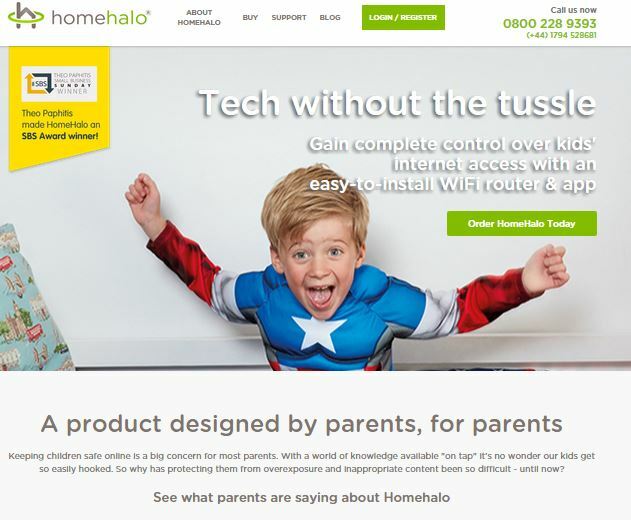 Research by HomeHalo, a parental internet control system, revealed one of the biggest causes of irritation was parents being ignored by their children when they’re online. It’s pretty clear what HomeHalo are doing here: bigging up the size of the problem that their product is on hand to solve. Louise Philips, of HomeHalo, added: ‘Although we can all see teenagers glued to their phones and tablets, the addiction begins much earlier. ‘It’s staggering that parents seem to understand the dangers – and are rightfully concerned – yet we appear powerless in addressing the issues. Interesting to see talk of technology ‘addiction’ in an article featuring a psychologist, and it’s no surprise that it’s not the psychologist raising the phantom of tech addiction. There’s a good reason for that. Still, why let science get in the way of your PR scaremongering? This entry was posted in HomeHalo and tagged daily mail, daily mail reporter, HomeHalo, Honey Langcaster-James, Louise Phillips on November 4, 2015 by Michael Marshall.